It’s 2013 already and best wishes for the coming year to all our partners, supporters and 1000 MPH Club Members. This is the year all speed fans should be looking forward to, as we are going to see some fantastic progress towards the setting of a new World Land Speed Record both from our Aussie Invader camp and several other teams worldwide, including our great mates and friendly rivals the Bloodhound SSC Team based in the UK. I was excited to touch base with BSSC’s driver and the “Fastest Man on Earth” Andy Green OBE over the Christmas break and to talk about some of the differences between each others approach and build programs. My team has been blessed with the amazing support of our 1000 MPH Club members and the product and design support from our project partners throughout Australia and the world, which has advanced our build with nearly $1m of parts and specialist services, including hundreds of hours of CFD, FEA and engineering design time. The Brits have for many years fought for and held the WLSR several times and her citizens understand what a magnificent and hard won battle that record is, with so much history and incredible stories of endeavour and achievement throughout the years. The UK is a relatively small country on the world map, but a giant when it comes to WLSR racing and is the centre for motor sport excellence, spawning a lot of design and development for Formula One, which is seen by many as the pinnacle of race car development. 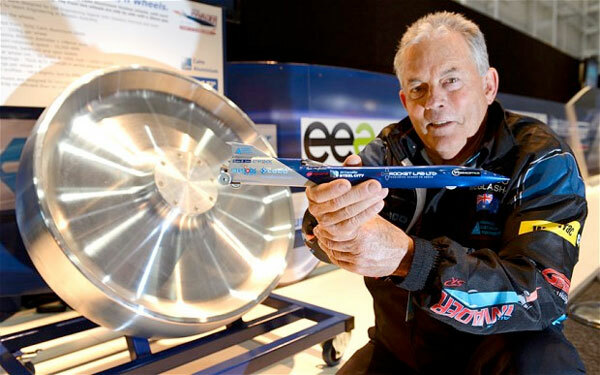 I have always believed that 1983 WLSR record holder (633 mph) and mate Richard Noble OBE is one of the world’s most gifted salesmen. His ability to excite and motivate UK businesses to open their cheque books and gain corporate support is astounding; his passion for what he does is superhuman. Well done Richard! This year is going to be the biggest yet and at the end of it we will hopefully have a car ready to test and attempt record runs, but to do that we need to make 2013 the year of fund raising and corporate awareness to support and complete the thousands of jobs needed to get us to the start line. Hundreds of additional manpower hours contributed to further develop our car and get her closer to completion. A full sized double sided image of our car produced along with a transport unit so that we can appear at special venues to promote our mission. The launch of the world’s first 1,000 mph wheel completed and race ready. Our rocket motors interface designed and built in readiness for engine tests. An 8m transport rack designed and built for Australia’s fastest car Aussie Invader 3 to allow her to be transported to special events/promotions throughout the country. Engine transport stand and wheel display stands designed and built. An appearance at the Australian International Motor Show in Sydney, with our rocket motor, 1,000 mph wheel and stand-up image. Numerous TV, radio and newspaper stories, motivational talks and guest appearances. The completion of our rocket motors torch ignitor test stand, and the design and machining of our torch ignitor. We strived very hard to complete the testing of this component before the end of the year but were unfortunately delayed due to the late arrival of some vital parts. Testing will be done early this month. Special thanks to all the companies who assisted with the building of this ignitor and test stand. Kentin Engineering for the great machining work on the ignitor. Trident for the high pressure regulators and gauges. The great crew at Prochem for the piping and fittings. WA’s best battery supply company…Challenge Batteries. 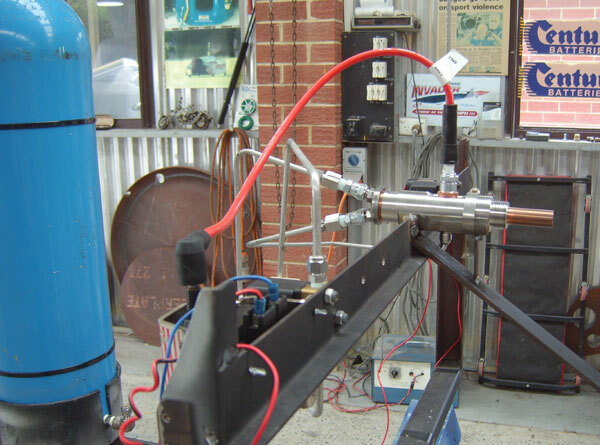 Rocket motor testing by Rocket Lab in NZ is high on our priority list. Have our car on wheels early in the year. Knock on a lot more doors to find the much need funding necessary to surge ahead. Visit and define a suitable race track location either in Australia or the US. Complete our composite sections on our car, nose, windshield canopy and tailfin. Fit out the car with all of her electronics/pneumatics and hydraulics. Launch a dynamic new website through a new high profile partnership with one of WA’s top web development companies... more about this in the coming months. Attend more high profile Australian Motor Shows. Thank you Rick and John from ARB for providing the onboard compressor and accessories needed to work our SMC rams and Braeko actuators. All that is left is for my team and I to wish everyone the very best for 2013, it is going to be a fast ride.